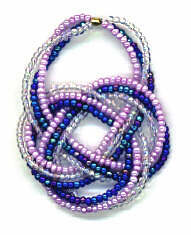 I have been experimenting with several knot designs and using Soft Flex wire and seed beads to make new creations. The Double Coin Knot design can be found in Chinese Knotting by Lydia Chen and the Editors of ECHO BOOKS, ISBN 0-8048-1389-2, Helby stock number B1993. The instructions in this book are for cords, but you can easily use Soft Flex instead. Anchor #8 thread or equivalent, approximately 12"
1 foam core board, approximately 10" by 10"
Use 3 distinct colors to make a real dynamite piece. Example: Color 1 - transparent or opaque pearl or cream, Color 2-matte rainbow blue, Color 3 - transparent rainbow grey. Experiment with various 3 color combinations together until you find one you like. Measure 13" of Soft Flex. Cut 3 strands this length. Take one hemostat and put the end of one strand in it. Make sure it is taut in the hemostat. Begin stringing on one color of seed beads. You do not need a needle, just stick them directly onto the Soft Flex. You can also stick the Soft Flex through the beads on a strand from a hank and pull the beads onto the Soft Flex wire. When you have 180 beads strung, take the 2nd hemostat and attach it to the other end. Now set this strand down on the foam core board, follow the illustration arrows and set T-pins in the middle of each loop you make to hold down the piece as you work. You may have to remove one hemostat to pull the strand portion beneath another portion and then put the hemostat back on. When you have the first piece formed like the illustration, put the hemostat back on the end and take the piece from the t-pins and foam core board. Put the next Soft Flex wire piece in the hemostat with the other beaded wire and string it with another color. When finished, use one hand to take it through the path of the first strand while holding the piece with your other hand and then put the other end in the 2nd hemostat. This is much easier to do than the first strand. 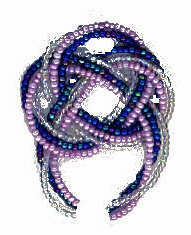 Do the same with the 3rd strand with the 3rd color of seed beads. You now have a pendant with three strands of seed beads running through it. See the illustration. Then take the hemostat off one end and put a crimp bead on three strands going one direction, put the other three strands through the crimp bead from the opposite direction. 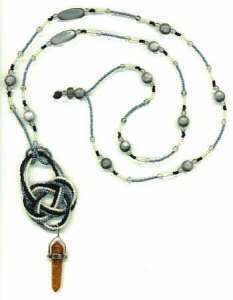 Pull the beads taut from the crimp bead and shape the pendant. Now turn the pendant upside down, this is the way it will hang on a necklace. See the illustration. Illustration with crimp bead here. Now go to Beadwrangler's Hands On Bead Stringing book to finish the crimp bead and make a Why Knot necklace to go with it. The photo image of the necklace with a pendant is a Why Knot necklace and the pendant is put on with a lark's head closure so I can interchange it with other items on the necklace. How do you get a fancy charm to hang on the end of the pendant? If you have a charm with a big hole for hanging, string in on after you string all three strands and pull it around and through the path of the knot until you get to the center. If you have a charm with a small hole, you will have to string the first necklace to the center, then put on the charm, then continue stringing beads and finish. You will have to fit the charm over each strand of Soft Flex while stringing to position it. Just think of all the other projects you can make with Soft Flex and seed beads. Enjoy! The Beadwrangler. For more Soft Flex projects see Beadwrangler's Hands On Bead Stringing. One of the projects in this book includes a necklace that you can use to wear your Double Coin Knot Pendant.